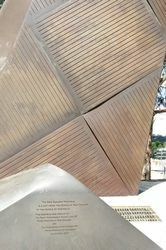 The memorial symbolises the ANZAC experience, still one of the most evocative links between Australia and New Zealand. The memorial stands 11 metres high and flanks both sides of ANZAC Parade. 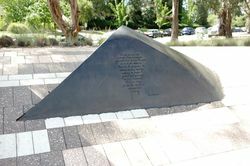 The memorial stands as New Zealand's gift to the people of Australia to mark the centenary of Australian Federation in 2001. 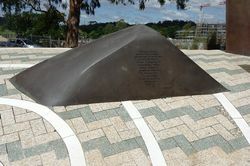 The invitation to build the memorial came from the Australian Government and was accepted by New Zealand in 1995. 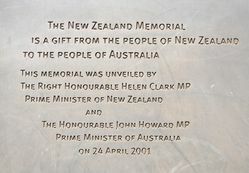 The memorial was dedicated on 24 April 2001 by the Prime Ministers of Australia and New Zealand, John Howard and Helen Clark. The Memorial also serves as a reminder of the long history of co-operation between the two nations and the close relationship. The design consists of a bronze representation of the handles of a flax basket, and woven flax is a particularly strong element in New Zealand culture. The design is based on a traditional Maori proverb "Mau tena kiwai o te kete, maku tenei" which literally translated means "You at that handle, and I at this handle of the basket". The proverb concerns sharing of responsibilities and joint effort to achieve a common goal. The basket handles symbolise co-operation, mutual experiences and sharing the load. At the base of each handle is a gathering space. 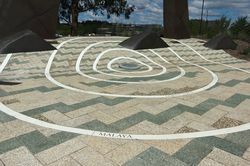 Each of these spaces are landscaped areas with indigenous Maori and Aboriginal artworks. The memorial sits on both sides of Anzac Parade at the southern end of the memorial area. There are similar structures at each site representing the handles of a Maori kete or flax basket but the design on the eastern side has a New Zealand emphasis and that on the western side an Australian one. The 'handles' are made of bronze and are 11.5 metres high. In front of each handle are bronze 'teeth' or nihoniho representing the top edge of the basket. There are five of these on the New Zealand side and three on the Australian. The kete handles stand on paving which is different on each side. On the Australian side the Aboriginal design is the work of Daisy Nadjungdanga from Maningruda in the Northern Territory, in association with the Sydney-based Urban Arts Projects. On the New Zealand side is a Maori design by Toi Te Rito Maihi and Allen Wihongi from Northland. The designs suggest the weaving of a basket and express the interweaving of land, its peoples and cultures. The arrangement is a metaphor of sharing the load and mutual experiences, both in peace and in war. 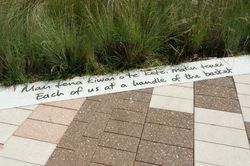 It is based on a Maori proverb: "Each of us at a handle of the basket". The front of each handle has a stylised woven pattern to reinforce the flax origin of the original concept, while the back has vertical fluting which alludes to the war memorial tradition of pillars and to the scars which are the price of war. Soil from Gallipoli has been buried in the centre of each paved area. On the Australian side it comes from Lone Pine, is contained within a jarrah box and marked by a granite block from the Riverina district. On the New Zealand side the soil comes from Chunuk Bair, sits in a rimu box and is marked by a granite block from the Coromandel. 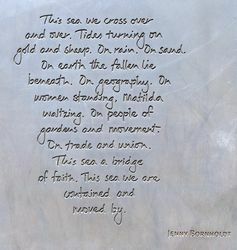 From each centre, which represents the importance of Gallipoli to the Anzac tradition, emanate, like ripples in a pond, the names of those campaigns in which the armed forces of the two countries have served and fought together. On the eastern side the colour of the paving is predominantly green, black and white, the colours of the New Zealand landscape. The stone from which the paving is made comes from Coromandel, Golden Bay and Canterbury so that visitors are literally walking on New Zealand. Similarly the Australian paving echoes the reds and browns of the Australian landscape. 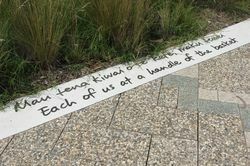 The theme of the memorial has a clear New Zealand identity and expresses the ANZAC relationship in all its diversity and richness. Sited at the head of the ceremonial area of ANZAC Parade the memorial is intended to link with other memorials on the Parade and to commemorate the bonds between the two countries that were forged in war. As it looks across the lake to the seat of Federal Parliament it is intended to express also the wider political and social relationships between the two nations. 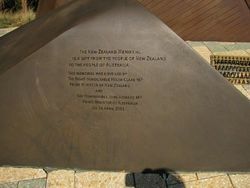 The New Zealand Memorial commemorates the unique friendship between New Zealand and Australian people. The two kete or basket handles express the shared effort needed to achieve common goals in both peace and war, and to acknowledge the courage and sacrifice of the servicemen and women of both countries who fought shoulder to shoulder on foreign soil. 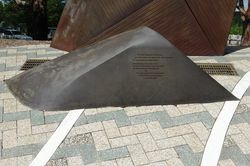 The memorial was designed through a collaboration between artist Kingsley Baird and architects Studio of Pacific Architecture, both of Wellington, New Zealand. The paving patterns upon which the kete handles stand represent the weaving of a basket and express the interweaving of lands, peoples and cultures. 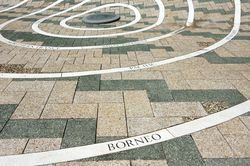 Daisy Nadjungdanga from Arnhem Land in the Northern Territory designed the paving beneath the western handle. 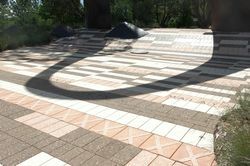 Toi Te Rito Mahai and Allen Wihongi from Northland, New Zealand designed the paving beneath the eastern handle. 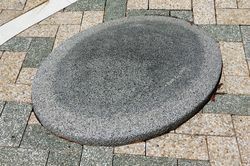 The surface of the paving is made with Canterbury, Coromandel and Golden Bay stone. At the centre of the paving on each side is buried soil from Gallipoli, the birthplace of the ANZAC tradition. 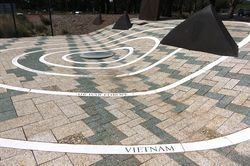 Inscribed on the paving are the names of the campaigns in which New Zealanders and Australians have fought together. gold and sheep. On rain. On sand.